Well this dampened paper business was never going to be simple. 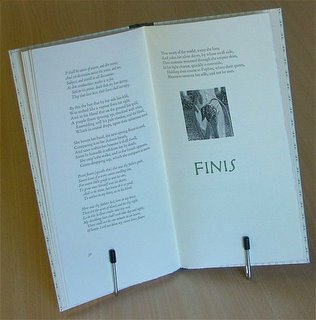 I have never tried it for a whole edition until and I need 110 perfect copies - soon. I started off on Saturday morning and the results were disastrous. The ink simply did not adhere to the paper enough to give a good black - just a washed out grey. In the end, I gave up, went indoors, lit a log fire and watched the rugby. I was out of sorts for the rest of the day but then had something of a brainwave in the evening which ascribed my failure to the low temperature in the studio. I had noted that the ink was very stiff while I was rolling it. I resolved to try again in the morning. Sunday morning was another crisp clear and cold morning. I boosted the temperature in the studio with another heater and propped the glass inking slab, and a tube of ink over a small oil filled radiator. At this point, we took Bella out for a gloriously sunny walk through the lanes and the nature reserve. When I returned, the studio was piping hot and the ink slab warm. I selected the music (live improvised ambient soundscapes by Robert Fripp) and made a large mug of steaming tea before setting to work. The ink was much runnier and a first attempt with dry Zerkall paper gave a lovely impression. I took the sheets of dampened Saunders watercolour paper and started to print. Things went very well indeed and I printed about 70 copies in about two hours. Things were starting to go wrong at this point. The prints were starting to smudge, as if the paper was shifting under the tympan. In the end, I lost five copies in a row and decided to give up again. I remade the packing but this didn't solve things. I tried a print with a loose card and paper pad between the block and tympan but had the same problem. I am sure that the problem is in the packing and I have redesigned this with a view of starting again this evening. I checked the prints, which are drying with interleaved sheets of paper between boards with bricks on top (neatly wrapped in brown paper) to keep them flat. I have 58 reasonable copies so I need over 60 more before I can finish this job. I was hoping to get this done over the weekend as I have engraving work to do. Its certainly put the dampeners on things! Still, yesterday evening was lovely with a log fire, candles round the room, a bottle of good wine and Bruckner's 9th Symphony in the background - well you have to get away from the ink sometimes! 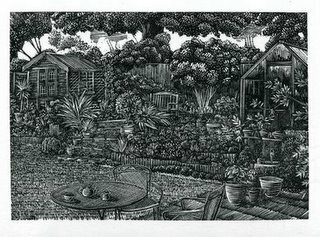 I showed this engraving "on the block" a few days ago and here it is finished. It shows part of the garden that we have made behind our house. The seat at the top is a ghreat place to catch the last rays of a setting sun. I am printing this for a book project which involved much heavier paper that I am used to. As a result, I am dampening the paper - something that I do not normally do. I was staggered by the results and this is making me rethink how I might print larger blocks. This has pleased me as I feel I am really learning something from this process. At the same time, it shows that my modest press can cope successfully with larger blocks on rougher paper. I have decided to use paper left in the studio of my dear friend Pam Hughes. I was given the paper when I helped clear the studio after she passed away. One of the dimentions is 11". Lo and behold, these sheets are already trimmed to 11". Sometimes you just know that things are meant to be. Thanks Pam - keep on looking out for me. Sunday was spent at the Oxford Fine Press Fair. This was my first opportunity to see "Venus and Adonis" finished. Even as I arrived, I was met with praise and congratulations for the engravings. 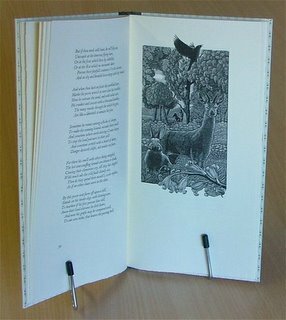 It turned out that for, this book, Barbarian Press had been shortlisted for the Gregynog Prize, to be " awarded to the FPBA member who, in the opinion of the judges, has produced the finest book using traditional letterpress techniques in the period since the last Oxford Fine Press Book Fair". When I finally saw the book, I was blown away. The design, printing and binding are all superb. I felt so honoured to be involved in the project. I particularly like the calligraphy that Crispin commissioned for the book. I have posted some photographs below so that you can get a flavour of the book. Click on any of the images to enlarge it. 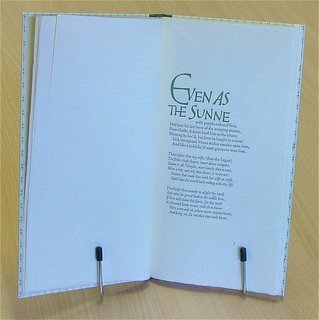 It will soon be available from the Barbarian Press website and through dealers on abebooks.com. 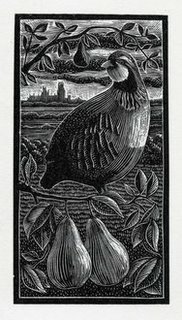 I really enjoyed the fair, catching up with lots of old friends and meeting new ones; it was particularly enjoyable to meet the engraver Abigail Rorer. 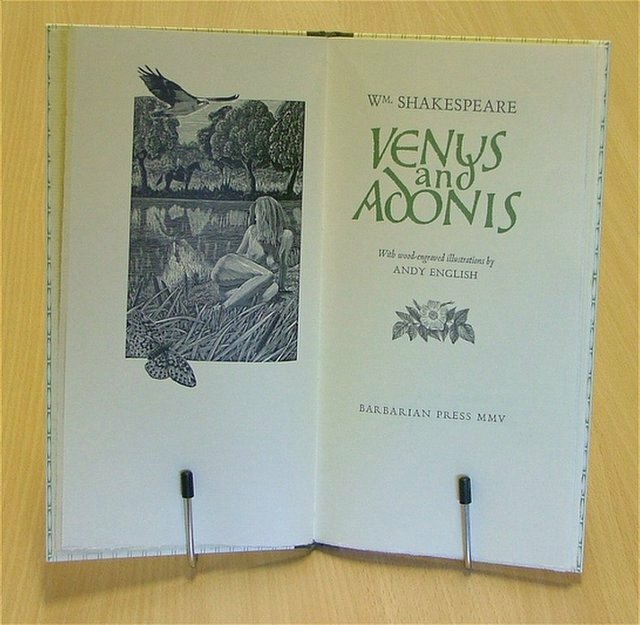 The book itself is a very handsome object, long and thin with printed pattern paper and label on the spine; a joy to hold. Now it is time to open it. Dont forget that you can enlarge any of the photographs by clicking on them. I had no part in this page but I love it for the wonderful calligraphy and typography. This is the engraving that I enjoy the most from this set. As always, Jan has printed this block to perfection. If I never engraved again, I hope that people would remember me fondly for this image alone. 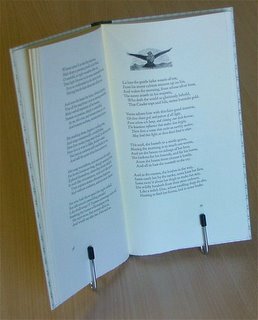 Readers of this blog will have already seen the lark as a block and as a proof copy. Here it is at the top of its page as planned. The final engraving (apart from the press device) with more beautiful calligraphy. I thought I would end todays long overdue splash of blog activity with some current work. This block is a material called "Resingrave". 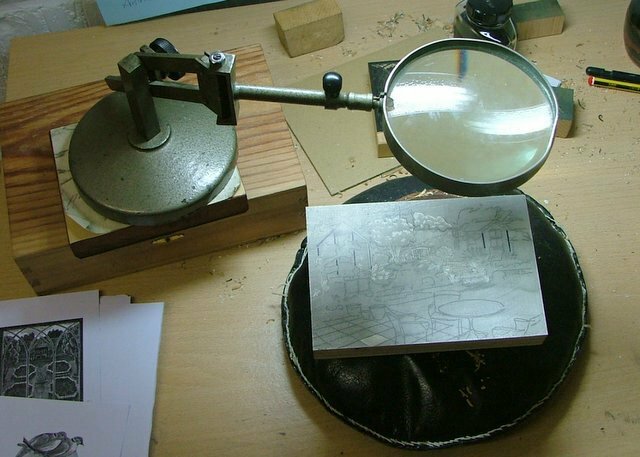 It is inferior to wood for much of my really detailed work but I do like it for larger and looser things as it is relatively inexpensive and does engrave well, especially the newest formula. 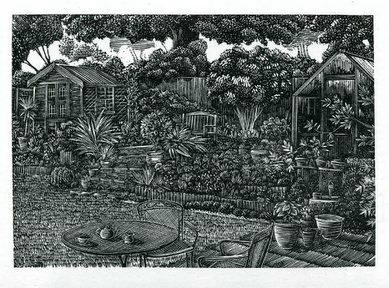 This project is a fairly loosely observed sketch of part of our garden. It is nearly ready to proof now so I will keep you up to date with its progress. Even with the broader treatment I am giving the marks, I stll keep the magnifying glass handy to inspect the tiniest areas. Well Autumn is definitely knocking on the door and I am resigned to cooler days. We have been reaping the benefits, thought, and Joan made the first batch of crab-apple jelly from the hedgerows. I have tidied up the garden and garage and took a van full to the "tip". I normally take a little money as they sell things that people have discarded. I normally come home with flowerpots, an office chair or somethng similar. This time I returned with a large flowerpot and two framed pictures - all for £4. 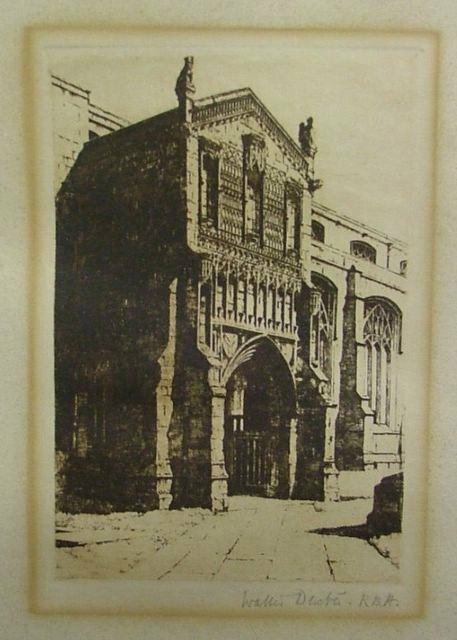 The first was an etching by Walter Dexter. Now Walter Dexter was probably the first artist who caught my young eye during an early visit to Kings Lynn museum in the county of Norfolk. I remember a painting of a workshop - rather like my Grandfathers' workshop - and a wonderful landscape of Kings Lynn seen across the river. These pictures made me feel something for the first time - possibly because I was seeing them for real, rather than looking at reproductions in books. Now I finally own a Walter Dexter. It shows the porch of St. Margarets Church in Lynn (I met my wife a very short walk from this doorway); it is inscribed "No.1" away from the image. There is a little staining on the sheet but the image is good. The second picture was a suprise. 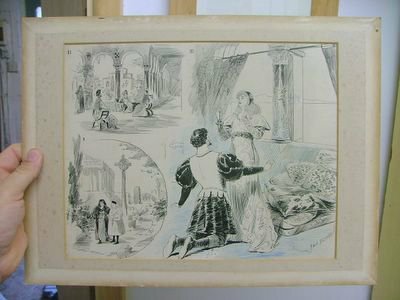 It is a sheet of illustrations by a very well respected French artist called Paul Destez, who worked around 1900. 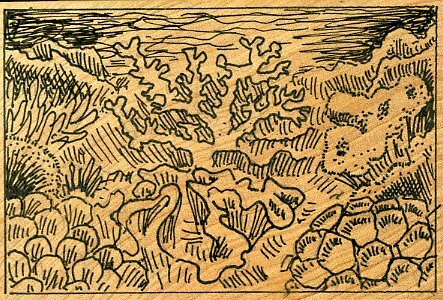 I love penwork from this era and this love helped establish my decision to work in black and white. 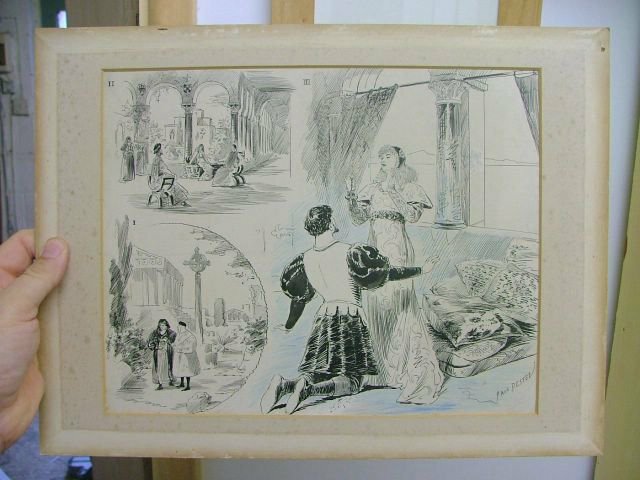 It now joins works by Robert Anning Bell and Ernest Shepard in my collection of original pen illustrations. Incidently, Destez was either an engraver or engravings were made from his designs. I think probably the latter. 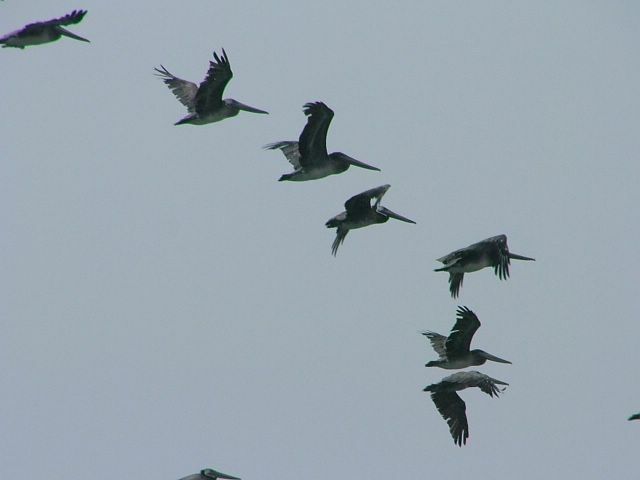 I have posted images of both pictures. An etching by Walter Dexter. A sheet of Illustrations by French Artist Paul Destez. Having finally posted details from the Venus and Adonis Illustrations, I was pleased to see comments but then disappointed to see that they are all obviously from spammers, promoting their products. Is there no escape from these people? Now I need to work out how to remove comments - or is my only option to turn off the comments - a great shame. 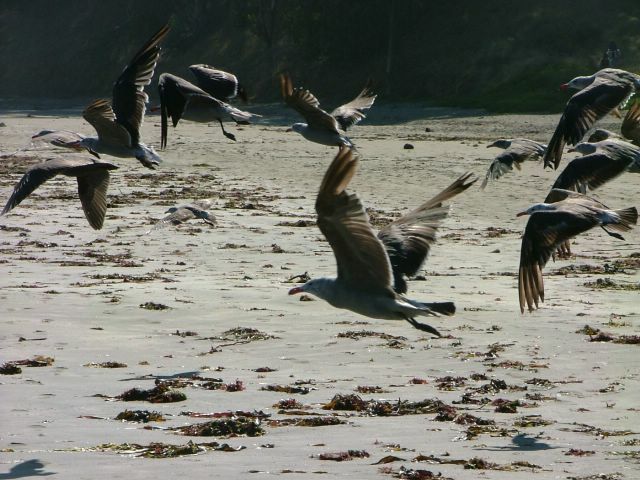 You may remember the saga of the doves. I finally sent the second block as I wasn't satisfied with the first. Sadly, the second developed a fault during printing so I made a third. 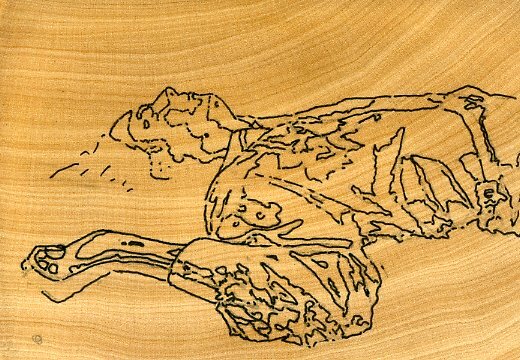 Again, there does seem to be a problem with the wood - quite crumbly so I sat down again last night and engraved version four. I will proof tonight and post tomorrow. I never want to engrave a dove ever again! Well, apart from those rants, things are good over here. The days are still quite warm and life goes on in a generally pleasing fashion. What more does one need? I ought to count my blessings more. My eBay sales are going quite well and I should make this month's payment on the press and save something towards having a drop handle made. 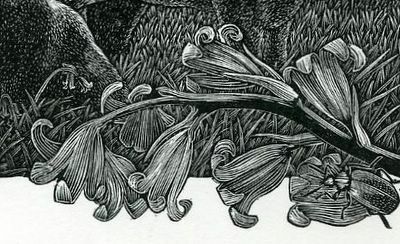 My next task is to make sure that I have plently of stock for a forthcoming weekend in North Essex where I will be demonstrating my work and, hopefully, selling engravings in an encouraging quantity. It has been a long time since I took myself out like this and I am looking forwards to it as, beneath the serious and reticent exterior, I do rather like to show off what I do. 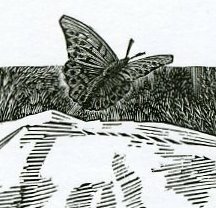 I have scanned my Venus and Adonis illustrations and will give you a tantalising glimpse of some of the things that can be seen around the fringes of the "action" that is taking place. These "nature notes" became an important feature of my designs and subsequent wood engravings. Another productive day. The wedding block and tail-piece are proofed with just a little adjustment to make on each. The corals are particularly striking and I am very pleased with the work - unusually after the first proof. It will only need a few more minutes work. There is a little more to be done for the tail piece - a series of small adjustments that will take about an hour. All of this is to be done early tomorrow morning as it is my father's 80th birthday and we will be spending the rest of the day with him. The fritillary design is ready to transfer to the block. Hopoefully I can start that late tomorrow night to finish by Wednesday lunchtime. Its all go! I'm really starting to look forwards to a holiday. This is the block for the wedding project just before I inked it and took the first proof. Yesterday got off to a slowish start as I took my older son to Hospital for an appoinment. Actually, things worked out rather well as I took my V&A file with me and, after about an hour of waiting, thinking and sketching, I had finalised designs for two of the part blocks that I had not yet started: the press device and the fritillary. The former is going to be another suprise and so I will not show it here. It involves a large number of elements and I spent much of the rest of the day drawing these pieces, fitting them together and then reducing the drawing to fit the 2 x 2" boxwood block that I have been saving for this particular image. 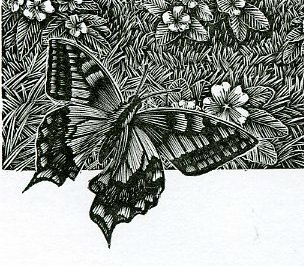 By 6pm, the drawing was transferred to the block ready for the engraving. After the appointment this morning, A and I walked through the small city of Ely. There is a craft and collectors market each Saturday and I was pleased to find a lovely ceramic bottle made at the Leach Pottery in St. Ives by Trevor Corser. This is my second piece by TC and it is a fine piece of work. The very low asking price put a spring in my step; I love a bargain! No work on Saturday evening as we travelled to a nearby village to celebrate the wedding of two friends. They live on a farm and the evening was perfect: great weather, good food and dancing in the farmyard to a band who played from the open doors of a barn. Its good to take a break eh? This morning (Sunday) saw me busy engraving the press deevice. Box is such a lovely wood to work on, especially if lots of detail is needed. I engraved throughout the day, taking breaks to walk the dog and clear up. The block was finished this evening and I had meant to take a proof but we spent far too long looking for a hotel in Berkeley, CA - that last night to fix up on out American adventure. I did manage to transfer the design for the wedding project onto its block. 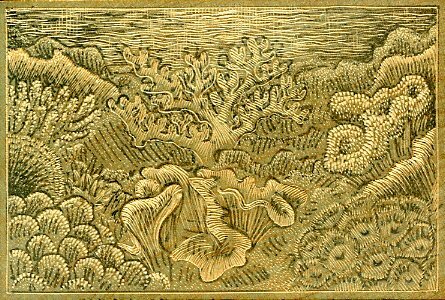 I will be engraving this as I crack on with the V&A blocks as its sometimes good to hget away from a project for a few minutes. Its late. I'm tired. So I wish you a "Good Night", gentle reader. Here is the block for the Wedding project. I have carefully drawn out the design in reverse onto the block. 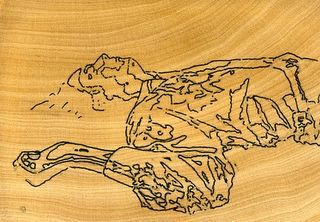 I will now darken the wood slightly with diluted "Quink" ink so that the light emerges as I engrave. Quite a productive day, today. Once again, I juggled references and sketches for V&A as I give "If He Be..." a rest and work on one of the full page illustrations. I keep tweaking the sketches to play with the balance of light and dark or reveal a shapely ankle, or more. It is good, sometimes, to lay down the graver and think about design. It must be right before I cut the wood and there is no going back. I also sneaked a few minutes sorting through type - I have to find some way to get my hands dirty if I'm not printing. The "doves" block is finally on eBay and I look forwards to seeing if anyone is interested. If I get anything at all, it will go towards new wood for future projects. Finally, I scanned and emailed the sketch for the EW wedding invitation. This is a very exciting project involving corals at night illuminated by moonlight filtering through the water. And now I can take an evening off as its party time out there in the Fens. Have yourselves a great weekend, faithful readers! 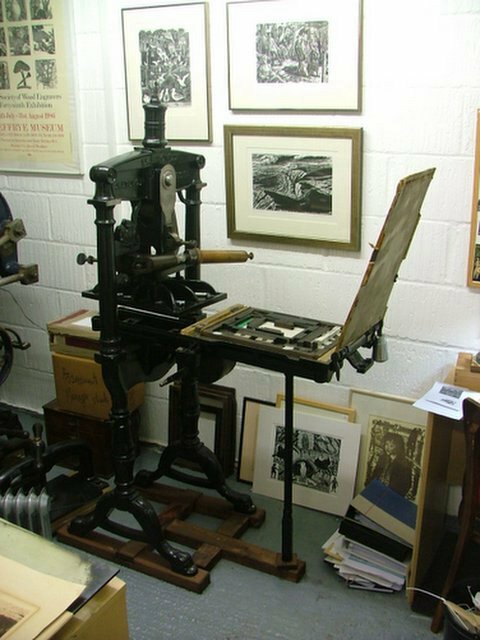 Over fifteen years ago, I bought the contents of a small print workshop. It was a modest collection of old worn type and other odds and ends but I always wanted to print letterpress so I went ahead and made my purchase. An immediate problem was storage. I made good use of much of the type in the early 1990s when I made small books for my own "Isle Handpress". After that, the type just sat there as I concentrated on developing my wood engraving. I have recently renewed my interest in letterpress and I have acquired small amounts of display type. However, I was short of larger amounts of founts suitable for text. Recently, I have been told that the room that I teach in is being refurbished. I have been going through the room and its cupboards and throwing out the accumulatiuon of twenty-five years of clutter. I pulled out a tall cabinet in a walk-in cupboard and felt the same delight as Howard Carter must have done on first looking into the tomb of Tutankhamun - twenty-five cases of type that I had salted away like a squirrel. Here were old friends: Blado, Albertus and Cantebury. Best of all was the discovery of many cases of Melior and Times Roman - enough to get me started on setting text. I have been engraving "If He Be Dead" for V&A. I started by very very carefully defining the tones on the face and now, exilerated and relieved that things are going well, ripping through the wood for the shirt. Great Fun! I promised some images to illustrate recent posts. Here they are. As usual, some of them can be enlarged by clicking on the image. Here is a larger block for V&A, "If He Be Dead..." You can see how I have divided the figure into areas of tones, based on my original drawing. 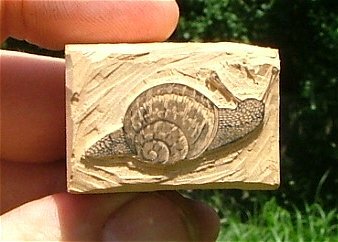 Here is the snail - the last "spot" for V&A in the block before the first proof was taken. 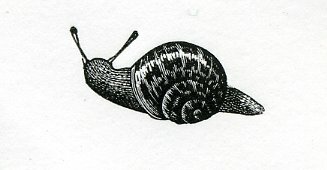 And here is the snail in person - or, at least, in ink.